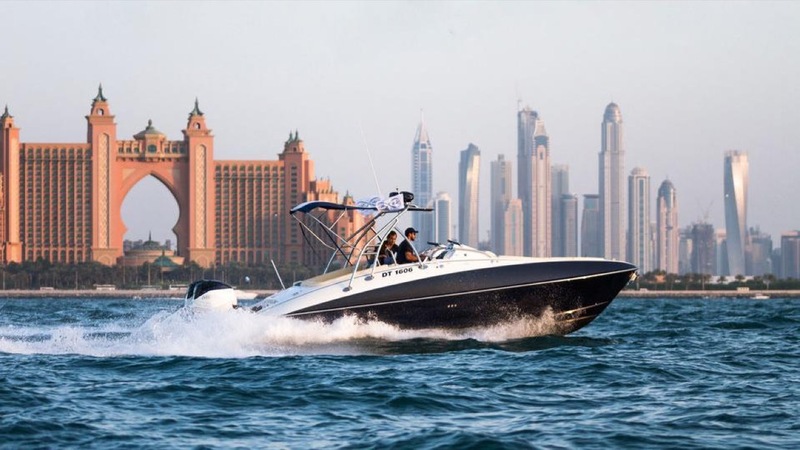 As we have mentioned a numerous times before, boat trips are becoming more and more common activity choice for residents and visitors of Dubai. 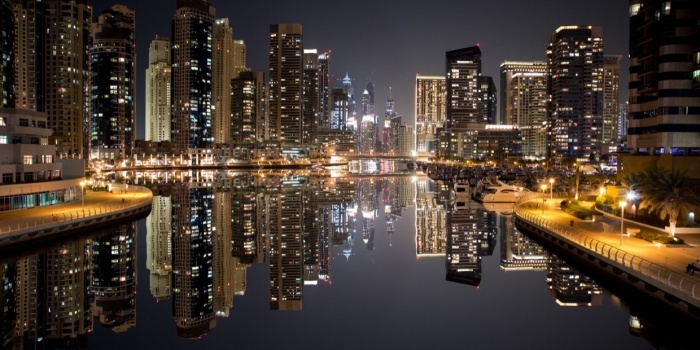 Sure, the city is well known for its beautiful skyline, tall buildings and one of the best hospitality service in the world, but there’s one more side of Dubai that you should definitely take a look at. The calm waters of Persian Gulf are giving everyone a chance to experience this vibrant city from a completely different perspective - trust us, once you see a setting sun while being on board of one of our boats, you will never forget it. Booking a sea ride is now as simple as asking a courier to deliver your food straight to your doorstep, but because of its simplicity, you may literally lose yourself among a vast selection of different boat types that are available for booking at CharterClick. But have no fear - we are here to help you out, and explain the difference between different types of boats and prices, that you can book at CharterClick.com The most popular type is, of course, a cruising yacht. These boats are perfect for almost any kind of activity you can imagine, and the interior can easily be customized upon your request. Just a simple sea ride to have fun in the sun and get that perfect tan you have always wanted - check. A romantic dinner during the sunset - check. An unforgettable birthday bash - check. Or maybe you want to throw a homecoming party for your 25 years graduation ceremony anniversary - that is absolutely possible. In other words, these boats are perfect for every and any single occasion you might imagine - the rest is up to you. 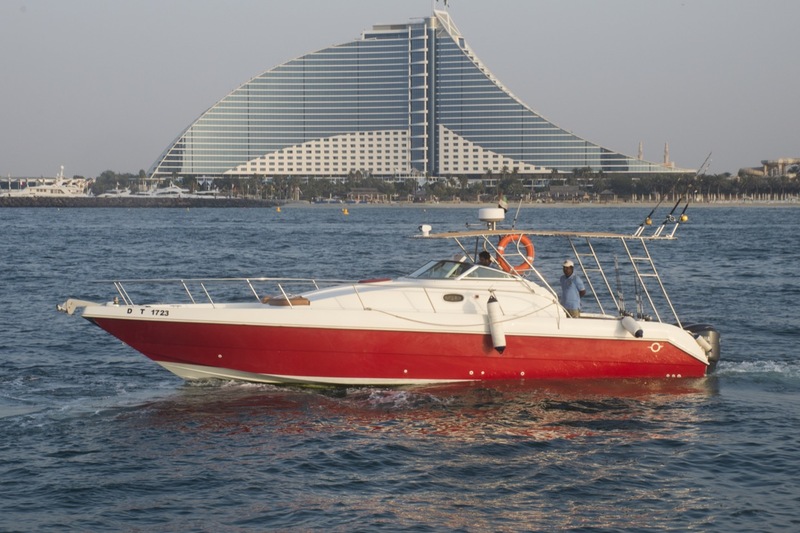 But if you just want to take a simple boat tour in Dubai, that would be absolutely possible too. A two-hour cruise would let you see a man-made Palm Jumeirah and its crown jewel - Atlantis; a three-hour ride may take you to an artificial island, where the famous seven star Burj Al Arab stands perfectly still; a four-hour ride would take you among the World Islands - a man-made archipelago right near The Palm Jumeirah, that was build in the shape of the world we all live in. 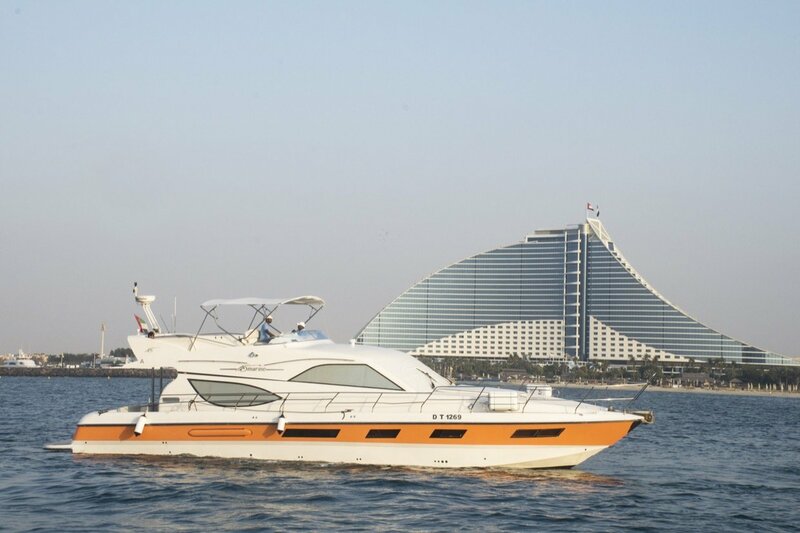 A five-hour cruise gives you an opportunity to take your time, and experience Dubai skyline like you have never did before - from aboard of a luxury boat. You may even cast an anchor in many of coastal lagoons, and go for a swim - the choice is absolutely yours. But what if you can’t imagine your life without spending a couple of hours every week with a fishing rod in your hands, or just like to occasionally go fishing once in a little while? Then you should definitely check our fleet of fishing boats. The boat can be booked in advance, so our experienced crew can prepare all the necessary equipment for your upcoming trip. Dubai is considered to be one of the best fishing destinations in the whole GCC region, so whether you are into ordinary fishing, trolling or even deep sea fishing, we can totally guarantee you - you will not be disappointed with your catch, and will have a time of your life. Beginners are welcome too - if you have always wanted to try, but never really had a chance to, you should not worry, because our friendly and professional crew will always be there to help you out every single step of the way. The fish you caught can instantly be grilled per your request, so you can enjoy your meal right on board. For those of you, who prefer speedy rides to serene boat cruises, we would suggest to check out our selection of speed boats. These quirky and fast boats can guarantee an unforgettable adrenaline-fueled experience, that would be impossible to forget. 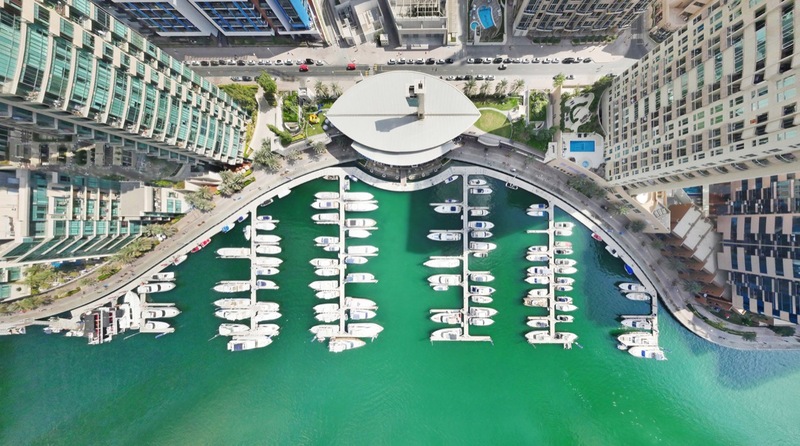 Two main boat parking spots in the city are a man-made Marina - one of the newest and most famous city districts of Dubai, and Umm Suqeum fishing harbour, that sits just a couple of minutes away from the famous Burj Al Arab. As you can see, Dubai has everything for a perfect boat trip - a vast selection of boats, unforgettable views, convenient parking spots and beautiful sunsets. And now there’s absolutely no need to waste hours of your precious time, while looking for a boat you need - everything can be done online and in one place. 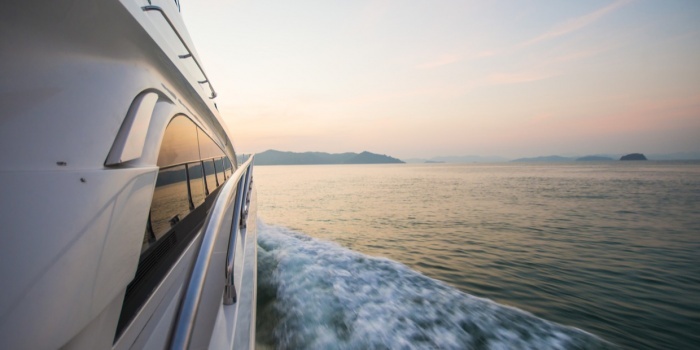 Because of the vast end ever-growing fleet, CharterClick.com gives you an opportunity to find that exact boat you were looking for, whether it is a gorgeous yacht, a fast speedboat or a fully equipped fishing boat. Once sure about your decision, it would take you just a couple of minutes to finalise the booking - enter all the necessary information, and you are ready to set sail. You will receive a confirmation right after the payment to your inbox, where you will be able to find the email and a phone number of the boat provider, in case you would want to make any last minute extra arrangements. 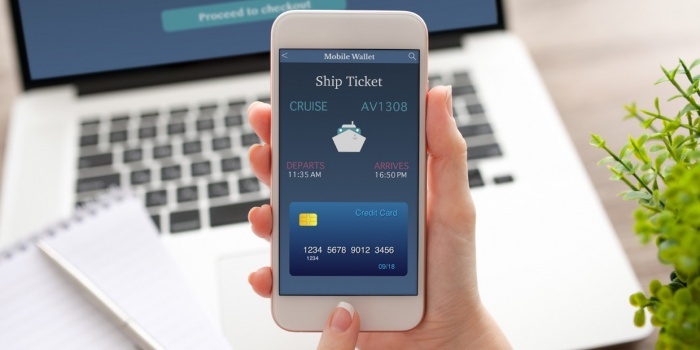 With CharterClick.com, you should no longer worry about additional confirmations, constant follow ups or last minute cancellation - now you book your boat online in just a few clicks. Be smart, book online.